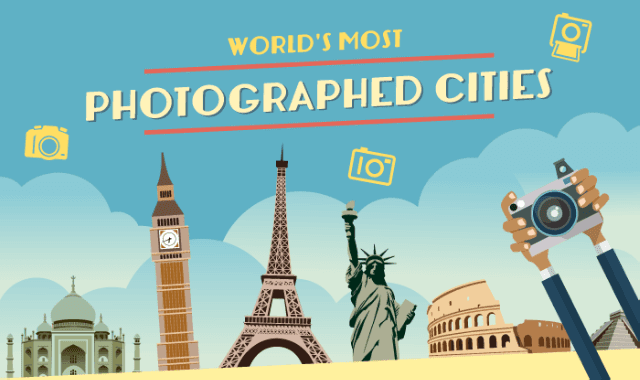 World's Most Photographied Cities #Infographic ~ Visualistan '+g+"
Is it possible to return from Paris without a shot of the Eiffel Tower? It certainly is, yet a perfect majority of us will find it difficult to resist the temptation to take a shot of this famous sight. And there is nothing strange about our love for documenting our travels to return to them in future. We have analyzed data from stock photo services and out of 507 cities located in 194 countries we selected the TOP 20 of the most often photographed cities of the world. Would you like to learn what we have found out? Have a look and see which of these sites you have already visited and which are worth taking your camera to. The most photographed sights in Milan are its vast Piazza del Duomo and the 14th century gothic Cathedral erected next to the square. The former capital of the Habsburg monarchy stuns with Baroque palaces, including Schönbrunn and Belvedere, together with their surrounding gardens. Moscow surprises visitors with its diversity and contrasts – large palaces neighbour with official edifices while modern office buildings are frequently interspersed with Communist monuments. Shanghai, one of the largest cities of the world, is China’s business and financial center. The most recognizable sight from this city is Pudong – a district of high-rise buildings and skyscrapers. In Istanbul East meets West, tradition meets modernity. Turkey with its Hagia Sophia temple attracts tourists from all over the world. The name of Thailand’s capital translates as the City of Angels, so the fact that Bangkok can boast approximately four hundred Buddhist and Hindu temples does not come as a surprise. Ireland’s capital and at the same time its largest city. Sights worth seeing definitely include the Trinity College and the edifice housing the Trinity College Library, as well as St. Patrick’s Cathedral. When asked about Sydney, its Opera House is the first thing that comes to everyone’s mind. It has become an icon of contemporary architecture, and together with the nearby Harbour Bridge they form a beautiful sight of the city merging with the ocean. During a stroll through Amsterdam, cyclists can be seen everywhere. A bicycle is the most popular means of transport in Holland and bikes of all types traverse along all the Dutch streets. The allure of China’s capital attracts visitors from all corners of the world. Architectural styles blending in Beijing include developments from the Imperial era, socialist architecture, and also most interesting contemporary projects such as the football stadium designed by Frank Gehry. Famous mainly for Gaudi’s architecture, the city of Barcelona is certain not to disappoint visitors with its abundance of attractions and fantastic vistas. Museums, galleries, concerts, and above all else Berlin’s notorious party scene make Germany’s capital one of the most attractive tourist locations for young people from all over the world. Los Angeles evokes associations of metropolitan life, skyscrapers illuminated at night and, of course, Hollywood. Do you know a single person who would skip the chance of taking a shot of the Avenue of the Stars or the Santa Monica Mountains? In the years 2011-2015, The Economist magazine found Melbourne the best city to live in the entire world. Australia’s second biggest and most populated city after Sydney, Melbourne with its characteristic rooftop bars and cafes is a large cultural and entertainment center. Italy is a perfect holiday destination and every visitor is bound to find something to suit their taste, starting from veritable gems of architecture, through museums and historic monuments, ending with a maze of mysterious Italian alleyways that are really worth getting lost in. The TOP 20 could not be a real top without Paris – the city of love. I don’t think there is anyone who visited Paris without having their photo taken next to the Eiffel Tower – the structure hated by Parisians and beloved of tourists. The architecture of Singapore – the Lion City – is dominated by high-rise buildings. It is difficult to accept that in the times of yore the entire area now occupied by the Asian metropolis was covered by rain forests. The capital city of Japan abounds in characteristic Oriental bazaars. Sites worth visiting include the harbor with its fish market as well as breathtaking cherry gardens, Buddhist temples, and the Imperial Palace. The city which evokes associations of American Dream and, at the same time, the city which apparently never sleeps … It is well worth checking out for yourself – to experience the buzzing pace of this huge metropolis’s life, blend into the crowds on Times Square, and afterwards relax in Central Park. First place in our TOP 20 goes to London. Sights photographed in this city are many: Buckingham Palace, Big Ben, the London Eye… Great Britain’s capital is also a vibrant entertainment center offering a multitude of concerts, gigs, and parties. It would seem that a lifetime would not suffice to see all these sights with one’s very eyes. Well … nothing is impossible! However, before you manage to set aside adequate funds and find the time for travel, we may enjoy the sights from our dreams within the four walls of one’s own apartment. A wall mural showing the destination of another journey will provide an excellent motivation to save for the trip, and at the same time, to find out if all the sites in our TOP 20 ranking are as beautiful in reality as they are in photographs.